Public attention recently turned to an organic garden in Atlanta that is designed to feed displaced people healthy food and establish a routine exercise in self-sufficiency—a practice also known as Agorism. It’s a rooftop garden operated by the Metro Atlanta Taskforce for the Homeless, an organization that seeks to help the marginalized group in ways that actually fix the problem rather than offering a temporary solution. Those contributing to the garden all reside at the shelter and are considered volunteer trainees who can participate and receive healthy food in return. 55 pounds of vegetables were harvested in the first season. The garden is composed of 80 beds and has already produced small amounts of kale, chard, carrots, radishes, squash, lettuces, and collards, among other fruits and vegetables. How often do you think about the homeless of America? Do you ever wonder what eating processed food every day (because it’s all they can afford) does to their bodies? A solution to this societal problem is needed, and the story of this organic garden fits into the larger picture of economic disparity and struggle in America. While productivity of workers increases, wealth and prosperity decrease. But organic gardens are on the rise in America, and make no mistake: this is a movement that will not stop. 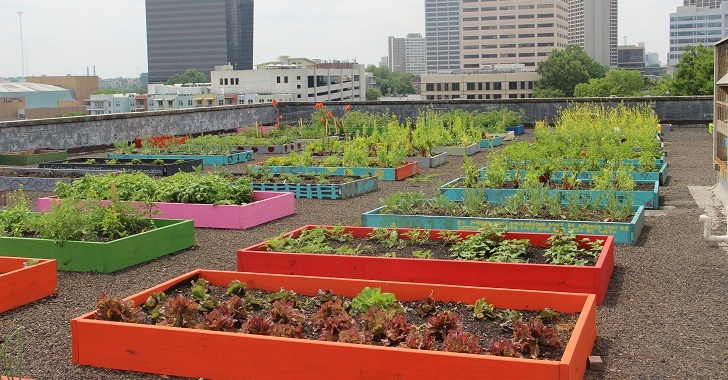 [T]he rooftop garden, which was first established in 2009 [but this year apparently saw the first harvest], serves as a means to teach homeless people about urban food production and sustainable technologies, while also giving them the chance to feed fellow residents, according to the group’s website. Due to the lack of independent infrastructure and economic opportunity, people become jobless, homeless, and hopeless. If we worked with constant effort to shape the future and build our economy back into the hands of the people, the younger generations can replace the old, hierarchical economic structures with their own and prosperity could once again be ours. To support the Atlanta Task Force for the Homeless visit their website.